In a world where kids are losing their ability to stack blocks due to their gadgetry obsession, the work of Sheila Dawson and her children's woodshop bus is more important than ever. 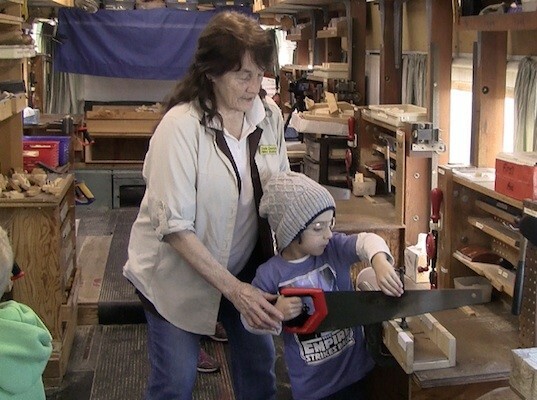 Dawson, who firmly believes that we learn by looking and touching and that we process the world around us by handling things, began teaching children with her traveling woodworking-workshop-on-wheels forty years ago. 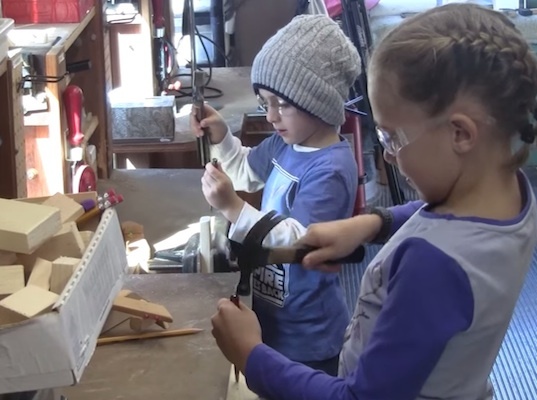 She believes working with our hands and producing something ourselves is an essential confidence-builder and a glimpse into her workshop (and her woodworking philosophy) is an inspirational and useful reminder to parents and kids of the simple joy of learning and creating with our hands. Dawson needs to retire her woodworking bus after its 40+ years of service, so consider donating or passing along info about a bus that might make a good replacement here, and keep this amazing, hands-on program going! RELATED | Thirteen Year-Old Sicily Kolbeck’s Self-Built Tiny Home is Complete! Sheila learned basic woodworking skills from her patient and diligent husband after asking him to build something for their son. Her husband told her that she could learn and develop these useful and creative skills, and with his guidance, she began building things for herself and teaching youngsters and launching her second career. Dawson is passionate about the workshops she does across San Diego County in public and private schools, community centers, camps, and private events (including birthday parties and teacher workshops) and enjoys teaching children the basics, including identifying the tools and safety skills. As she says, "Because so many schools are turning their woodshops into media and technology centers, it's more important now than ever to provide opportunites for kids to learn crafts and trades or we will have no one to build our houses, fix our cars, or even repair a computer." But beyond the practical aspect of woodworking, Dawson also recognizes another, equally important but often forgotten element: "My joy is to see a child leave the bus exclaiming "Mom, Dad, look! I built it myself." I know first hand what that accomplishment feels like and how it can change you because it changed me...My students come, see, and conquer and I am crazy in love with being able to help them do that."